Reigning champions, the winners one year ago, Japan’s Kasumi Ishikawa and Mima Ito retained their Women’s Doubles title at the 2018 ITTF World Tour Asarel Bulgaria Open in Panagyurishte on Sunday 19th August. At the final hurdle, the no.3 seeds, the beat Chinese qualifiers, Liu Gaoyang and Zhang Rui in four games (10-12, 11-7, 11-7, 11-6). Both left handed and right handed partnerships, the left handers being Kasumi Ishikawa and Liu Gaoyang, the right handers Mima Ito and Zhang Rui; it was the Japanese duo who made the better start. They established a 6-1 lead in the opening game, the fast attacking strokes over the table from the backhand of Mima Ito, the side of the racket on which she uses the short pimpled rubber, proving most effective. Liu Gaoyang and Zhang Rui were not able to find a rhythm to their play but with Liu Gaoyang clearly the team captain they reduced the deficit to 8-4, the stage at which they started to play with confidence. They levelled at 9-all and on their second game point converted. Once again in the second game it was the Japanese pair that made the better start, with Mima Ito directing her play towards the body of Liu Gaoyang, a 5-2 led was established, the deficit was reduced to one point at 6-5 but the Chinese pair never gained parity; at 10-5 Kasumi Ishikawa and Mima Ito held five game points, two were saved not a third. Now more confident, increasing the pace of the play, Kasumi Ishikawa and Mima Ito established a 5-2 lead in the third game, Liu Gaoyang and Zhang Rui reduced the margin to one point at 6-5. Immediately Kasumi Ishikawa and Mima Ito called “Time Out”. Liu Gaoyang and Zhang Rui won the next point but they were never able to establish a lead. At 10-7 Kasumi Ishikawa and Mima Ito held three game points; they succeeded at the first attempt. 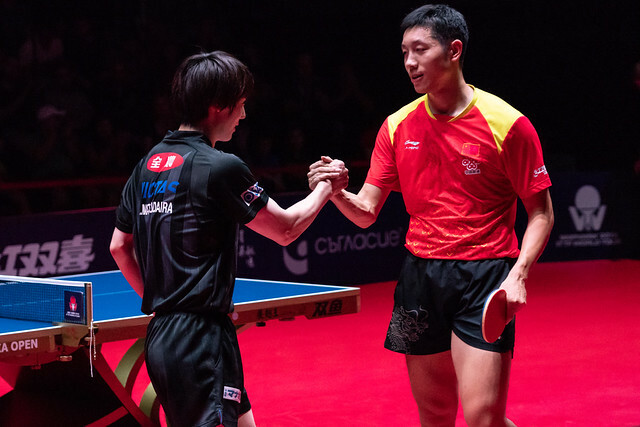 The momentum now with Japan, the Chinese duo making errors returning service, Kasumi Ishikawa and Mima Ito went ahead 5-3 in the fourth game; Liu Gaoyang and Zhang Rui elected for “Time Out”. The ploy proved to no avail, Kasumi Ishikawa and Mima Ito, the better pair over the table, near the net, won the next point; at 10-6 they held four match points. They succeeded at the first attempt, the title was successfully defended.